DAX - Deutsche Boerse AG German Stock Index DAX is one of my favourite indices to trade. It appeals quite well to daytrading strategies. During the trading day, it could move in some 200-300 points in average and having a margin account would offer great returns compared to money invested. Of course, the risk is also higher. Unfortunately, if trade it through US futures brokers, it would require a considerable margin amount required to wire into your trading account. It is not the case as with S&P 500 - SPX where you could have a daytrading account with a margin requirement as small as $500. That is why, currently, I trade DAX through a CFD broker which on the other hand has its negatives as well. However, the good points are the small amount of initial margin to invest, fast execution and no transaction fees (which are calculated in the spread of course). As for the moment, it is good for me having a spread of 1 pip and after taking a position in a two-pip move I am holding a profit position. 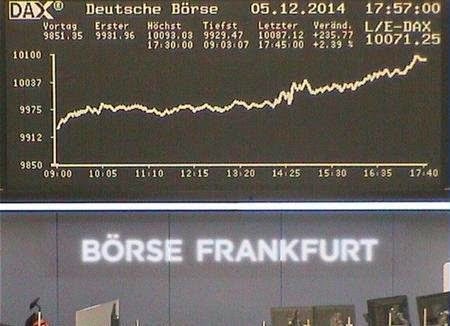 DAX index is traded at Frankfurt stock exchange; it is computed daily between 09:00 and 17:30 Hours CET. The L-DAX index (Late DAX) is calculated from 17:30 to 20:00 CET. Another interesting thing about trading DAX is that it correlates with the Dow Jones Industrial Average Index and some how follows it once the US market is open. To sum it up, DAX is very nice for daytrading, volatile and liquid. Unfortunately, currently, I don't have much time during the day to trade DAX and I only follow it during US trading time and trade SPX but I do hope to get some free time and return to the routine trading this good index.